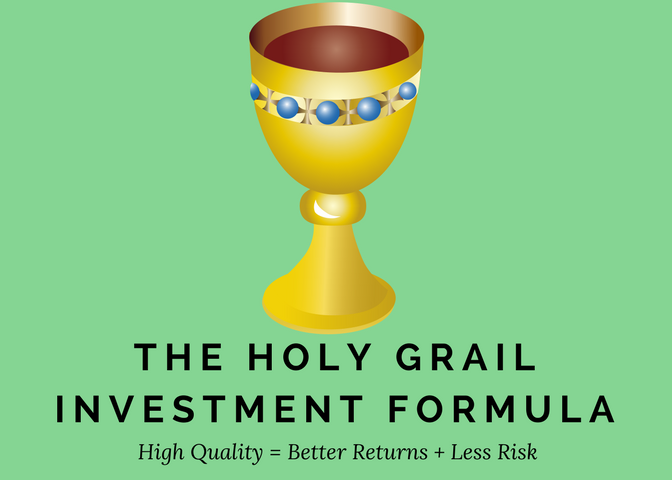 In my last post, The Holy Grail Investment Formula – Part 1, we came to the conclusion that if you focus your investments in high quality (wonderful) businesses you can earn better returns than investing in low quality companies. However to borrow a line from your favorite infomercial… “But wait there’s more!” High quality stocks are actually less risky too! That’s right, better returns with less risk, the ultimate investment combination. ValueLine, founded in 1931, is a highly regarded independent investment research firm that ranks companies by “Safety” ratings. Their rating system compares and combines a company’s balance sheet, financial strength and price stability to arrive at a safety rating (similar to the S&P Quality Rankings). I used the ValueLine safety rank data during the last 16 stock market corrections from 1972 – 2016 to calculate and compare high quality vs. low quality performance during major market downturns. As shown in the table below, high quality stocks go down much less (-14.6% on average vs. low quality stocks -31.0%) during significant stock market declines. To put the comparison of High Quality vs. Low Quality during a typical correction in dollar terms, if you had a $1,000,000 investment portfolio in low quality stocks at the beginning of an average correction, it would have shrunk to $690,000 7-months later. However, by comparison, a $1,000,000 investment in high quality stocks would have dropped to $854,000 – a much less painful decline! Most importantly, going down less in a bear market also means it is much easier and faster to recover from the decline and ultimately reach new recovery highs. By focusing your investments in stocks of the highest quality, you not only can increase your returns and lower your risk, but you can also sleep better at night. Why do high quality stocks better protect your portfolio during major market declines? To answer this question it’s important to understand when major market declines are most likely to occur. Typically the worst market declines occur when the economy enters a recession. In fact, over the last century, 3 out of every 4 bear markets for stocks (-20% or greater declines) have occurred during recessions. By definition, a recession is a shrinking business environment: sales and profits decline in aggregate. As companies lay off employees to cut costs, the unemployment rate rises and household income decline, creating a grueling economy. This is precisely when high quality businesses thrive. Typically, these companies continue making money while their competitors struggle to stay profitable. Their outstanding financial strength and steady profits provide added flexibility to go on the offensive when their weaker competitors are doing all they can to simply stay in business. In the midst of a recession led bear market, investors crave the added security of high quality investments and are reluctant to discard wonderful companies when economic uncertainty reigns supreme. In other words, high quality stocks tend to be owned by long-term oriented investors who much prefer to add to their investments when the going gets tough, while other short term oriented investors may sell into weakness. This helps to keep high quality stocks from undergoing dramatic and sustained downturns, providing an additional layer of protection to your hard earned money. So, there you have it! High quality is the road map to the Holy Grail of investing (better returns with less risk). By focusing your investments in stocks of the highest quality you not only can increase your returns and lower your risk, but you can also sleep better at night. Efficient market hypothesis proponents believe it’s impossible to achieve better returns with less risk, so they recommend to buy everything (index) and follow your “random walk” down Wall Street; however, numerous studies, including financial research from Standard & Poor’s and ValueLine, confirm that the quest for better returns with less risk is attainable. There is no doubt that over our financial advisory firm’s 40-year history, one of the most crucial factors that has helped our clients sleep better at night is the fact that their hard earned money is primarily invested in high quality businesses. Jim Kopas, CFA Jim's “professional” career began at the ripe old age of 11 when he started a dog walking service in Walnut Creek to help neighbors with especially energetic pets. After just a few months of walking dogs and with years of accumulated birthday savings, Jim had enough money to open his first investment account. He has been enamored with investing ever since. Jim holds a BSC degree in Finance, from Santa Clara University. In 2013, he earned the Chartered Financial Analyst®(CFA) designation, one of the most respected and recognized investment advisory designations in the world. Jim is Financial Planner and Investment Advisor at Pring Turner, Walnut Creek, CA.